Nanotechnology’s stupendous growth in recent years has led us to something even more revolutionary: DNA origami. It refers to the highly-specialized technique of DNA folding, as a means to create two- and three-dimensional shapes in nanoscale. 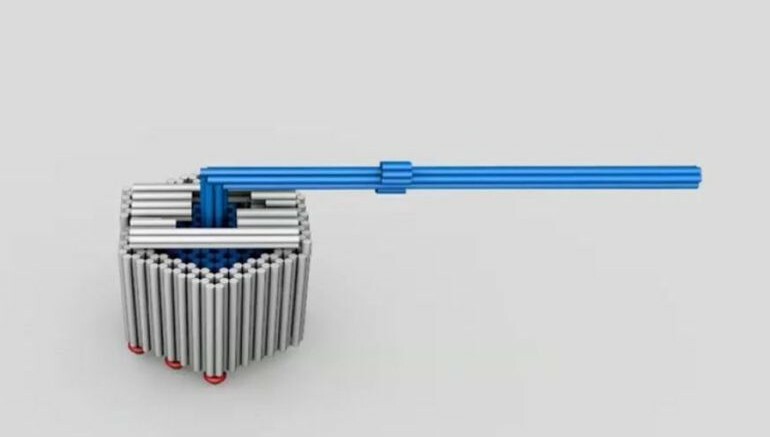 Using this technology, a team of scientists has developed what appears to be the smallest rotary engine in the entire world. It’s a step toward the long-term goal of artificial nano-robots. You could easily imagine a future where similar such motors are used for propelling nano-robots in our bodies, much in the same way that bacteria naturally move about. According to the researchers, the rotational motion of the motor’s blade generates forward thrust that could in turn propel a variety of robotic devices. To construct the engine, the scientists relied on the process of DNA origami, in which strips of physical DNA material are used as scaffolds to form different structures and machines. The team is currently trying to create nano-sized versions of all the tools found in an engineer’s toolbox, such as clamps, hinges, bearing and others. … a great building material with some interesting physical properties. And, we use chemically synthesized DNA, which you can get loads of for cheap. At present, the nano-sized device is not exactly a “motor”, since it is powered with the help of atomic collisions. The engine’s rotational motion is produced using energy harvested from the irregular collisions of surrounding molecules, a phenomenon which is also called Brownian motion. Consequently, the researchers do not have any control over the direction in which the rotors turn, nor can they actually switch the motor on or off. It’s still a faraway goal when we have an [steady] energy source and can control the directional motion of these devices.